Free Printable Graduation Day Word Search. Free Printable Graduation Day Word Search that you can give to your kids during the Graduation ceremony. You can print and share this activity to your friends, students, family, neighbors and teachers. Great for a Graduation Day party celebration. Search for Graduation Day words like Graduate, Diploma, Honor, Award, Tears, Parents, Gown, Pictures, Valedictorian, Efforts, High School, Alma Mater, University, Medal and more. This word search includes 24 Graduation Day words and the answers on page 2. 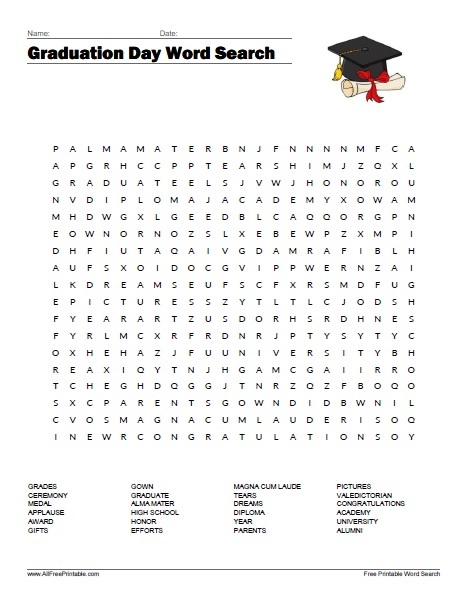 The Graduation Day Word Search Puzzle is ready to print in PDF format. Congratulations!